Fr. 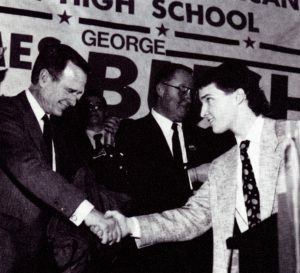 Charles Bolser greets Vice President George Bush when he arrived in 1988 at Saint Viator High School. 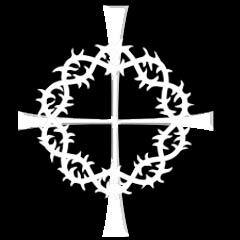 1986 – 98 — including shepherding the all-boys school into a coeducational institution. 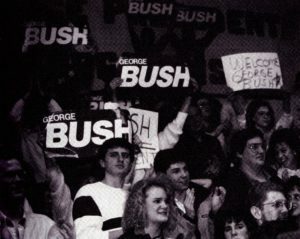 But one that stands out is the day the school welcomed Vice President George Bush to address the students and faculty. 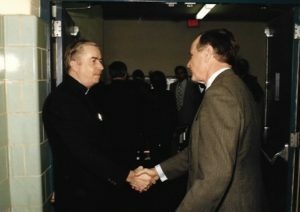 Senior Tim McCaffrey greets Vice President Bush. 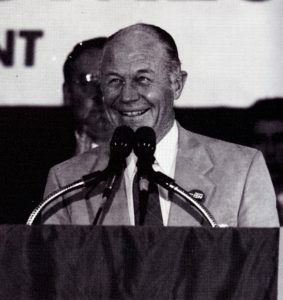 Former fighter pilot, Chuck Yaeger, also addressed the crowd. Students decorated the gym and held up signs. 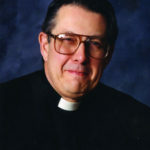 “There was great excitement about his visit,” Fr. Bolser recalls. “He was very cordial and approachable. He was accompanied by his wife, Barbara, as well as Gov. Jim Thompson, astronaut Jim Lovell and (former fighter pilot) Chuck Yeager, and they all seemed very grateful for the opportunity to talk to our students.